Happy at the Bronx Zoo. A 47-year-old Asian elephant named Happy has lived in isolation at the Bronx Zoo for the past 12 years. A team of lawyers is now fighting for Happy’s freedom, saying she’s a legal person who’s been falsely imprisoned. If this sounds familiar, it’s probably because you’re recalling similar cases involving the rights of chimpanzees. In this latest case, the lawyers are the same, as is the state in which the hearings are being held—but the species is different. On Friday November 16, Judge Tracey A. Bannister of the Orleans County Supreme Court in New York state issued an order of habeas corpus for Happy, who is being represented by the Nonhuman Rights Project (NhRP), an animal welfare group. It’s the first time in U.S. history, and probably world history, that a judge has issued a habeas corpus order for an elephant. The legal implications here are significant; should the judge agree with the habeas corpus order—which recognizes a person’s right against unlawful detention—it could mean that Happy, and by consequence all elephants, are legal persons under state law. The court has scheduled a hearing for December 14 in Albion, New York, where lawyers from both sides will make their case. Previously, the NhRP was able to secure habeas corpus orders for chimpanzees, which were ultimately rejected in court. The NhRP lawyers, it would seem, are hoping for better luck with elephants. The respondent in this case is James J. Breheny, director of the Bronx Zoo and the Wildlife Conservation Society (WCS), which operates the zoo. “The Nonhuman Rights Project is exploiting the Bronx Zoo elephants to advance their own failing cause in the courts as they put forth ludicrous legal arguments and lies about our elephants, facilities and staff,” explained Breheny in a statement to Gothamist. “We are thrilled Happy’s case is moving forward,” Steven M. Wise, founder and president of the NhRP, said in a statement. “And we look forward to litigating her case on the merits on December 14th.” Should Happy be relocated to a sanctuary, she will “meaningfully exercise her autonomy to the greatest extent possible, including having the opportunity to live and interact with other elephants,” added Wise. Happy was born in the wild and brought to the United States when she was still an infant. The Asian elephant was relocated from Florida’s Lion Country Safari to the Bronx Zoo in 1977. 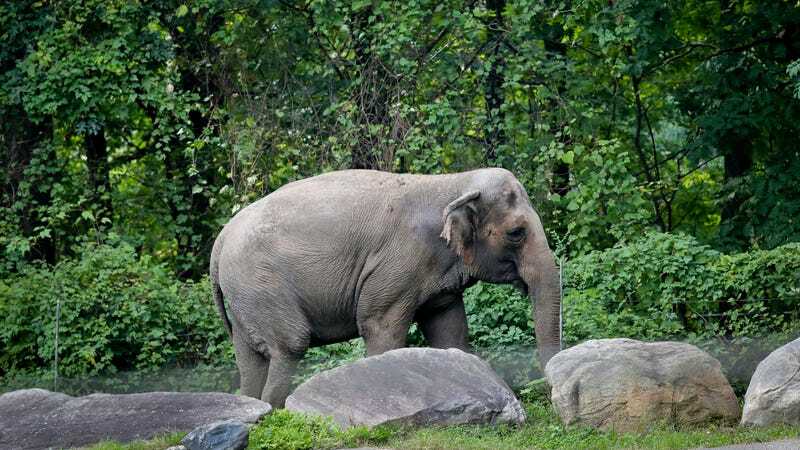 In 2006, at the age of 30 and for her own safety, Happy was isolated from elephants Patty and Maxine, the latter of which was (coincidentally) euthanized this week. Back in 2002, Maxine fatally injured Grumpy, Happy’s elephant companion, according to the New York Times. So for the past 12 years, Happy the misnamed elephant has lived alone—a situation the NhRP deems untenable for a highly social species. Though the NhRP lawyers lost their previous habeas corpus cases, there’s reason to believe the Happy case may go a bit differently. Earlier this year, as the State of New York Court of Appeals upheld the 2017 ruling of an intermediate appellate court, one of the appeals court judges, Eugene Fahey, issued a provocative concurring opinion. Fahey’s statement may not have a bearing on the December 14 hearing, but it could represent an evolution of thought on the matter. It’ll be increasingly difficult for U.S. judges to deny habeas corpus if the prospect of nonhuman animal personhood is normalized in society, and as scientific evidence continues to affirm the sophisticated cognitive and emotional capacities of a select group of nonhuman animals, including chimpanzees, elephants, cetaceans (dolphins and whales), and possibly some birds (the African grey parrot comes to mind). Kerry Bowman, a bioethicist at the University of Toronto, said this latest case is indicative of a larger trend. Gizmodo reached out to the Bronx Zoo and the Wildlife Conservation Society for comment. We’ll update this post should we hear back. Disclosure: I am the founder and chair of the IEET’s Rights of the Nonhuman Persons Program, and I have collaborated with the NhRP in the past.